The Steps and their DN’s are visible at the beginning. Torg Eternity is a very open game. Part of the flow of a DSR is coordinating between the players who should take a Step, and preparing for more difficult stages with cards or cooperation. It also ratchets up the dramatic tension if several steps go by without progress, and the group knows a difficult step is lurking towards the end. One person can roll an attempt each round. Hands down the most overlooked rule in a DSR, and one I’m guilty of getting wrong at my own table. If you have more than one person who wants to work on the step, you must have a primary character and everyone else is cooperating—either granting a static +1 or testing against the DN (“Extra Effort”) to try and provide more of a bonus. Corollary: If a card has two or more letters the person making the test for the round must choose whether to try just the first step, or Multi-Action to try to get others. Other characters can cooperate to add a +1 bonus to one step, or one or all of them using Extra Effort with the appropriate Multi-Action penalties. What isn’t legal is for one character to finish one step, and then another to take an action to resolve the next step. For another character to take the lead you must wait another round and hope the correct steps appear on the Card. Seize the Initiative is great for this kind of tactic. Succeeding at a Dilemma also resolves the current step. If the current step was B and a Critical Problem appears, the test is rolled for Step B, and if successful Step B is resolved. If the test fails or isn’t attempted at all then the Critical Problem effects kick in. Note that only one person can make an attempt each round, so someone else can’t just try again thinking that the Dilemma now represents Step C. This is a change from the original version, mainly because the default time for a DSR dropped from seven rounds to five. Sometimes the cards aren’t kind and the steps you need don’t appear in time, or an unlucky roll costs too much time. This is where Last Ditch Effort comes in. The character attempts all the remaining steps, whether they’re on the card or not, with an extra -2 penalty. So if the DSR was on Step B, then B, C, and D must be tried at once—two extra actions for a -4 penalty, and then Last Ditch Effort for a total -6 penalty. Multi-Actions roll a single test and apply the bonus generated to all the skills, so make it good! Playing for the Critical Moment is probably necessary, depending on how far into the DSR you are. There are two side effects of Last Ditch Effort if you fail. One returns it to Step A, essentially resetting the DSR. There’s a bright side: this reset allows another character to try, now at -8 (three extra actions and the -2 for Last Ditch Effort.) The downside is the other side effect: this becomes the last round of the DSR, no matter what the original timing was. If someone else can’t come through on the same round, the DSR fails, usually with catastrophic results. It’s usually best to wait until the last round for a Last Ditch Effort. More Steps are cleared and Action Pools are full of cards. If the DSR is easy enough you can push it through early with a Last Ditch Effort, but Mishap will ruin your day. A quick word about Chases. They use the same grammar as a DSR, but there are differences. The most obvious is more than one character can roll for a step each round—in fact they have to, everyone gains steps completely on their own. It’s also worth noting that Last Ditch Effort apples to DSR, but doesn’t apply to Chases. Just as above, a Dilemma counts as your current Step, so success completes it, but doesn’t allow you to try for another step and failure (or failing to make an attempt) carries the extra consequence. Now that the intricacies of DSR’s are out of the way, let’s look at them from the design side. The first and most critical rule of thumb for the DSR is: Don’t overuse them. Because it’s a fun mechanic, new writers and GM’s tend to put a DSR in every adventure or act, and this can be a mistake. If you find yourself trying too hard to come up with ways to make the Steps always need to be in the same order, it’s probably just a series of options and regular tests, not a DSR. If you’re struggling with what a Critical Problem that pushes the team back to Step A looks like, it’s probably not a DSR. If it doesn’t make sense for one person to do all the Steps in 10 seconds, it is definitely not a DSR. There’s plenty of ways to get things done, save the DSR rules for spaces where it really fits. Involve skills based on two or three different Attributes. 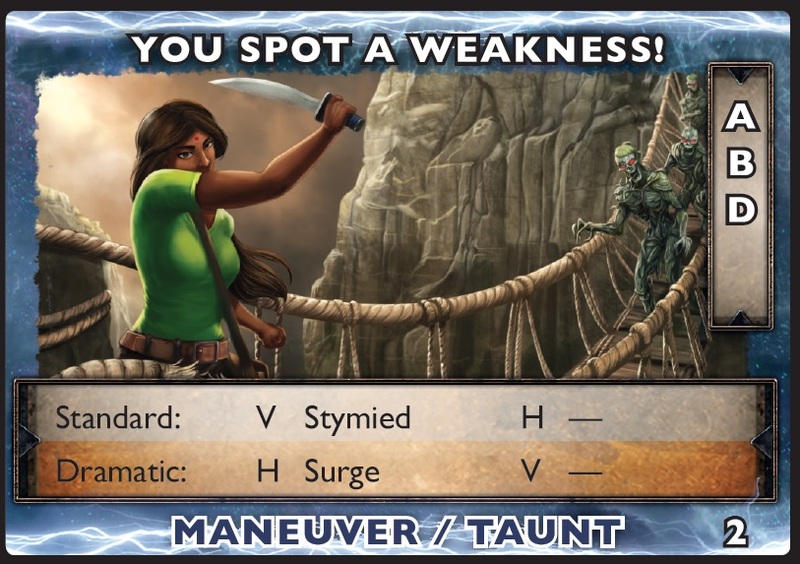 This is totally different from the original TORG version, where every step used the same skill. Employing different skills allows different characters to take the lead at different times within the task, and really ramps up the difficulty for an early Last Ditch Effort. This varies by the nature of the task, some DSR’s will use the same skill for every step, but note that such a task is comparatively easy and should have a higher DN to compensate. Involve skills that don’t get as much spotlight. It’s satisfying when a skill that was purchased just for flavor comes up as part of a DSR. Suddenly those adds feel useful, and the character gets a cool moment out of it. Be wary of the DNs associated with these skills, a rare pick combined with a high DN can be brutal to solve. At least one Step should have a very high DN. I like to save this for Step B or Step C, and set a DN of 18. This forces several heroes to join in on the test, or manage their Destiny Cards to put it over the top. A high DN also makes a Last Ditch Effort unattractive early on. Most steps should be DN 12 or 14. Define the Dilemmas and assign penalties to them when they make sense. A default DSR doesn’t have penalties on the Dilemmas, but there’s a clear opening in the design space for them that’s seldom used. I’ve always liked the idea of using DSRs, but I agree they should not be used in every adventure, let alone every act. The timing of the DSR, however, I think I’ll keep open. A relatively simple DSR, such as (A) finding the correct dial among a scattering of dials, (B) finding the locking mechanism or triggering mechanism to allow you to activate dial to release an over-pressure, (C) having to rush to redirect the exhaust of that over-pressure because you didn’t realize the function, and (D) realizing you have to release the dial to keep just enough pressure in the system, yeah, that’s five rounds. However, as you said, with chases it’s different, and I think time-limits, such as a bomb counting down in nine rounds instead of five, should change these parameters as necessary. If something is going to go wrong for a failure, I think the magnitude of the failure should be used to change the length of available time for the DSR. I’ve always found them a bit difficult because the cards often don’t cooperate. I’ve done trial card draws where step A didn’t arrive until four rounds after the start of the draw – or at all – and telling players “nope, you can’t do anything” over and over can be really frustrating and feel like they’re being defeated by complete chance with no chance to fight back. Especially if nobody has a Seize Initiative to mitigate that. Any time the word “whatever” starts getting repeated it’s a bad sign. Do the four steps really show up in order within five rounds all that often? In theory they do show up, in order, the majority, maybe the vast majority, of the time. This would be a good time for original Torg’s Gamemaster Fiat. Is this a change from the rules as printed? ‘Cause they say that you use the combined actions chart to calculate the bonus rather than this “static +1”. What I meant to say is the POTENTIAL magnitude of the failure. Hence, if there’s an anti-personnel grenade, it’s not to be disarmed but discarded, preferably a long way away. An anti-tank mine, five rounds should work. A structure-leveling explosive device you’re looking at seven to nine rounds for the DSR. A nuclear device, ten-plus rounds on the DSR.